One hundred and sixty kilometres up the West coast just 2 hours out of Cape Town, South Africa is small coastal town well known for its Crayfish – “Paternoster“. The Crayfish season usually starts in November where you can go and catch your own crayfish as long as you have a licence, from 08h00 until 16h00 and the bag limit is four per person per day and the size restriction is 80 millimetres carapace length. It can make a great weekend for a couple eating 8 crayfish on a braai every day and is definitely a better fresh sea taste and way cheaper on the pocket. Don’t forget when you prepare (clean) the crayfish, that you need to remove the vein that goes down through the tail. You could use Justin Bonellos Strandloper Crayfish recipe? As far as we’re concerned it’s the best and simplest way to cook those crawlies. Well that’s food taken care of! 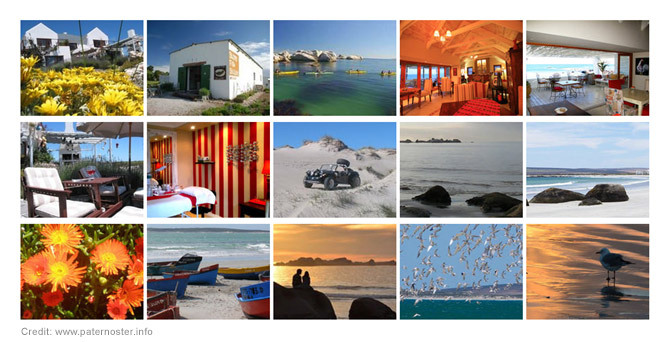 And you here in Paternoster for the weekend, so what can you do? 1st off there are a variety of accommodation to stay at from B&B to catered or self-catered, 1, 2 or 3 bedroom house close to the sea or the Sea Shack. Which is a small, eco-friendly, seaside retreat within Cape Columbine Nature Reserve, about 5kms from the fishing village of Paternoster. The focus is on living sustainably and peacefully with nature. With 10 charming little wooden shacks that accommodate 2 people each. Of course you can just eat out at one of the many great restaurants in the village that cater for couples or families to eat Pizza to amazing seafood with wine, or my favourite the “Noisy Oyster” that has an amazing outdoor setting and delicious food cooked with love. The weekend can be filled with art as you wander around the village, a sea kayak in the morning to go see Dolphins, seal and whales that frequent the calm bay. Or just a simple chill and do nothing. You could book a Chauffeur Drive for a day trip or hire a car for the weekend.